Registration is handled by the EDAS system. ACM and IAPR member registration only: includes attendance to all sessions and the practitioner day, CDROM with proceedings, social event, and conference banquet. Includes attendance to all sessions and the practitioner day, CDROM with proceedings, social event, and conference banquet. Students only: Includes attendance to all sessions and the practitioner day, CDROM with proceedings, social event, and conference banquet. Includes attendance to the practitioner day, social event, and conference banquet. Includes the social event and banquet ticket for the accompanying persons. In case payment requires wire transfer please see http://www.netbank.com/banking_deposit.htm. The social event will take place at the Netherlands Institute for Sound and Vision. The Netherlands Institute for Sound and Vision was established in 1997 as the result of a merger between three large audiovisual archives and the Broadcast Museum. Substantial collections of radio and television programmes, documentaries, commercials, amateur films, photographs and music are all to be found at this institute. The (total) archival holdings include materials dating from the earliest days of cinema right up to current news broadcasts. The size of the archive is estimated at 700,000 hours worth of viewing and listening. The major collection currently held is that of the (Dutch) public broadcasters, the magnitude of which increases daily. 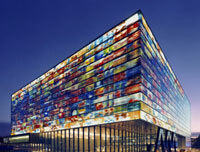 On December 1st, 2006, the Netherlands Institute for Sound and Vision opened a futuristic building which houses the Beeld en Geluid Experience. It is a hands on exhibition for the general public and for schools to experience the position and the power the media hold in our society. See New York Times Architecture Review: Heaven, Hell and Purgatory, Encased in Glass by Nicolai Ouroussoff.